Enjoy the sounds of yesteryear and today every Thursday evening in the Grand Ballroom. Featuring a LIVE Big Band and vocalists. Playing everything made popular by Glenn Miller and Tommy Dorsey to Frank Sinatra, waltz, swing, cha-cha, salsa, even a line dance. Admission is only $10 per person, Club members are $7.00. Everyone is invited, whether you’re single, couple, or with a group. 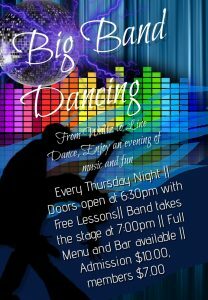 Free dance lessons start at 6:30 pm, and the Band takes the stage at 7:00 pm.